And the winner is Melbourne! It is with great excitement that we announce Melbourne as the host city for the 2023 Rotary International Convention, the largest conference secured this century for Victoria. Melbourne is a Big Events City! Set to deliver over $88 million to the Victorian economy, the Convention is the most valuable conference ever won for the state, with the four-day event anticipated to attract more than 20,000 Rotarians from around the world. The global spotlight will be on Melbourne and how we present ourselves to the world. The Convention will take place 27-31 May 2023 using superb venues; Rod Laver Arena and the Melbourne Convention & Exhibition Centre. All activities and events are within the Heart and Soul of Melbourne. Over 7000 hotel rooms over 50 properties across Melbourne. Our transport plan uses our famous trams, ferries and buses to quickly and easily move delegates between venues, hotels, event and restaurants. And of course, Melbourne is a very walkable city with many interesting routes and laneways to tantalise visitors. In addition, the Victorian visitor economy will be bolstered with expenditure from thousands of visiting Rotarians utilising transport, hospitality, entertainment, venues, attractions, tourism services, event planning, freight customs broker services, technology rental, security and various other members of the local business event and tourism supply chain, as well as the flow on benefits across regional Victoria for pre and post touring. 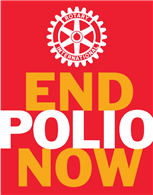 Rotary has a business heritage as well as community service. We are proud to make an impact on local business and create jobs. The effort to secure this exceptional event was no small feat. Our approach was tenacious, going that extra mile to demonstrate Melbourne’s ability to meet the stringent bid regulations and strategically demonstrate our capacity to accommodate the specific needs of Rotarian delegates and Convention format. This was all made possible by a unified approach between the Melbourne Convention Bureau, Rotary Club of Melbourne, Rotarians from 5 local Districts, Melbourne City Council, State Government and Team Melbourne partners. They have come up with a package that is bound to thrill delegates. Our local Host Organising Committee is shovel ready. Team members are drawn from 5 local Districts, RC Melbourne, the Rotary Foundation and the 2014 Sydney RI Convention. We will work with an International Convention Committee and staff from Rotary International based in Evanston, USA to deliver the best possible Convention. The focus of the Host Organisation Committee is on Promotion, Publicity, Welcome, House of Friendship, Events, Customer Experience, Finance and Volunteers. The current team will be expanded in coming months to add more horsepower with a broader talent pool. Melbourne has previously hosted this Convention in 1993. And the 2014 Sydney RI Convention has fast tracked our ability to create a wonderful event. Our Sydney colleagues have shared their experiences and systems to give us a flying start. A vital part of hosting is to have an engaged and energised volunteer team to assist all visitors during the Convention. 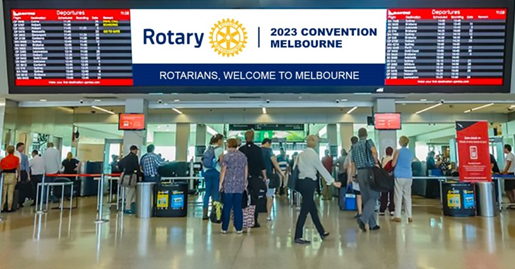 We wish to include volunteers from all ages - so be a Rotary Ambassador for Melbourne by registering to volunteer at the Convention in 2023! Recruitment starts immediately at multiple District Conferences to be held in Melbourne and Maryborough in February and March. In the meantime – “Save The Date” 27-31 May 2023. In the future a dedicated website is planned for volunteer registration and other Convention information - until then please connect to www.rotaryclubofmelbourne.org.au for progress updates.